Experience America's oldest & most mysterious living city from the perspective of a local with this walking tour of the French Quarter. Hear about the secrets lurking in numerous alleys named after past sinners and saints. Enjoy the gorgeous architecture of the St. Louis Cathedral at Jackson Square, and inhale the abundant scents of Creole cooking that waft in the air. Head for the unique and historic French Quarter to meet your guide for this informative and fun tour. Guests will be allowed to stop in bars along the tour route to grab a to go drink and then the tour group heads out to the next location. Please keep in mind that some bars allow children inside however some do not. During this tour guests will see the New Orleans' Pharmacy Museum, constructed in 1823 for the first licensed pharmacist in the United States. The newly renovated courtyard contains an herb garden that illustrates the traditional uses of plants for medicinal purposes. Live leeches, leech jars, 'blood-letting' devices, 'gris-gris' potions used by Voodoo practitioners, and rare patent medicines are just a few of the displays. Hear the history of the pharmacy museum that you would not learn anywhere else. Guests will stop by the Cabildo a Louisiana State Museum - one of the most historically significant buildings in America. Throughout the building there are more than 1,000 artifacts and original works of art, including 'The Battle of New Orleans,' Eugene Louis Lami’s huge 1839 painting that shows intricate details of the final and most decisive battle of the War of 1812. There are also portraits of famous Louisiana figures, exquisite engravings of nature artist John James Audubon, and many interactive displays, all of which tell the story of Louisiana and its place in American history. Of course this tour would not be complete without a stop at St. Louis Cathedral. The cathedral is among the tallest and most imposing structures in the French Quarter, and one of the most recognizable. It is one of the cultural and architectural treasures of the city. Next, see The Old Ursuline Convent, one of the oldest buildings in the Mississippi River Valley. The main lodge is filled with dozens of oil paintings of past archbishops, bishops, religious statues and bronze busts. Behind the main building, there is a peaceful walled courtyard. Here the visitor finds statues that pay homage to founding Ursuline Sister. Hear the famous story of the casket girls while here. 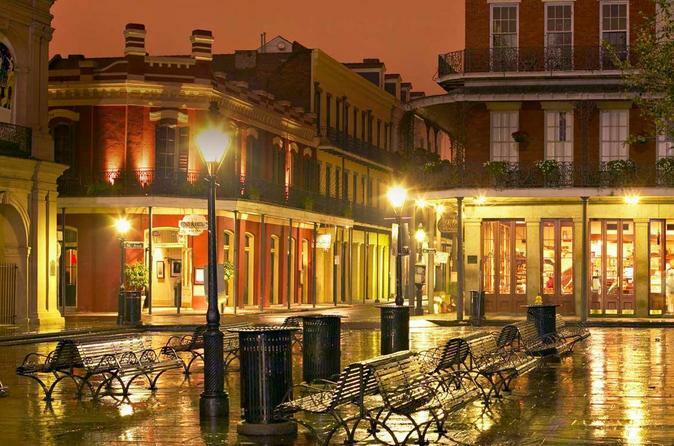 Visit the Historic Jackson Square, originally known in the 18th century as 'Place d'Armes' and later renamed in honor of the Battle of New Orleans hero Andrew Jackson. It is a timeless attraction in the heart of the French Quarter. This famous landmark facing the Mississippi River is surrounded by historic buildings, including St. Louis Cathedral, the Presbytere, and the Cabildo. Learn the complete history of Jackson Square. Guests will see one of the oldest homes in the Mississippi Valley, now a museum. Learn about many other legends in New Orleans history that have been passed down for generations. New Orleans ghost and vampire stories will also be shared during this entertaining tour. Real paranormal equipment will be used. Tour route is subject to change without notice.